Grass mowing is the most time-consuming and expensive part of garden maintenance. But mowing at the proper height (usually 1.5″ – 3″, depending on the type of grass) and dispersing the small glass clippings evenly so they fall down to the soil, can provide many benefits. – Mowing grass too short causes stress, discourages deep root growth, and results in rapid loss of soil moisture. – Letting grass grow too tall causes excess grass clippings that can smother the turf. – Raise the mowing height during the hot and dry season. A higher setting reduces moisture loss and encourages deep root growth. 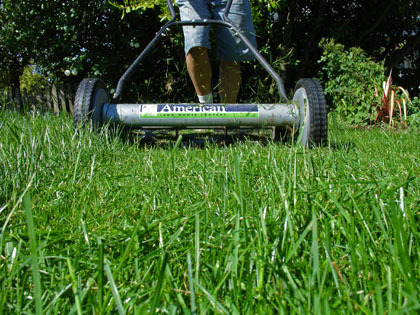 – Keep mower blades sharp and clean, and mow when the grass is dry. – Mow over leaves so they will decompose along with grass clippings. – Collect leaves and grass clippings for mulching or composting if they are too heavy or wet for grasscycling. Grasscycling results may be improved by using a mulching mower, by replacing a standard blade with a mulching blade, or by covering a mower’s outlet spout. The benefits of grasscycling are many. It makes turf greener and tougher. It prevents common turf diseases. It reduces or eliminates fertilizer needs. Grasscycling provides about 2 pounds of nitrogen per 1,000 square feet of lawn per year. 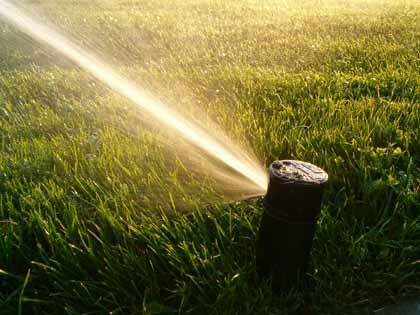 It cuts down on watering needs, and eliminates the disposal of grass clippings and leaves. Check out our Guide To Different Types of Grass, which includes mowing height and other detailed information. This page helps you Choose The Best Type of Grass For Your Lawn.